You forgot to download Big Stretch	. Click the link below to download it. Staring at a monitor for too long, without taking a break, can have severe consequences on your eyesight. Besides that, your muscles and joints can be affected if you stay locked in a certain position. Taking regular breaks is the best way to prevent damaging your eyes and to avoid any symptoms of repetitive strain injury (RSI). Big Stretch will remind you to take a break at regular intervals. Its main focus is to prevent RSI symptoms, but you can also use it to remember other tasks, like coffee breaks, if you want to. The application is lightweight and free. It takes only a few seconds to download its setup file and to install its components. You can use Big Stretch on Windows XP, Vista, Windows 7 and Windows 8, without sacrificing too many resources. You can also download a ZIP archive and extract the application's files, without going through an installation process. 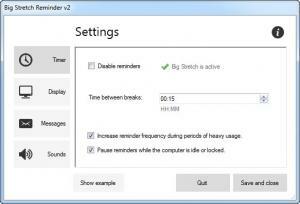 Big Stretch works in the system tray and it displays various reminders, when a timer runs out. You can adjust the application's behavior on a compact settings panel. Depending on your personal settings, Big Stretch will display balloon reminders in the lower right corner of the screen, pop-up windows, or a micro-break window which contains a countdown timer and a progress bar, to show you how much time you have until the break is over. Other configurations can be made in different sections of the same window. Reminders can include random RSI tips, motivational quotes or custom messages. You can set up your own time period between breaks and set the application to pause the reminder feature when the computer is idle or locked. Alternatively, the reminder frequency can be increased automatically, if the computer is used intensely. If you want to enforce your breaks, Big Stretch can disable your desktop when it displays pop-up or micro break windows. Additionally, Big Stretch can play a sound when a reminder is triggered. It allows you to choose between four default sounds, but it also lets you select audio files, in any format. You can set Big Stretch to be as subtle or intrusive as you want. The application allows you to set up your own time intervals and decide what type of messages to display. On top of that, Big Stretch can pause the reminder feature or increase its frequency, depending on how much you work on your computer. It is not possible to set up parallel reminders. Big Stretch provides simple, but effective features to help you remember when it is time to take a break and prevent various health issues. You can download Big Stretch free here.